Retirement - Gifts - Balloons - Perth Florist Perth in Western Australia specializing in flower delivery of roses and wild flowers. 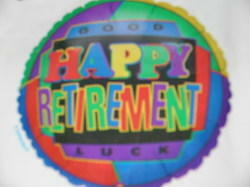 45 cm foil balloons are filed with Helium and float above your gift. More than one may be ordered - they look great in a bundle. Balloons are only provided as an accompaniment to Floral or Hamper presentations. Price includes flowers and gifts delivery to all areas by local Perth florists. To Add this product to your order, use the "Add a Gift" menus when placing flowers in your cart.